There's a well-known mantra in the blogosphere that every website administrator has come to appreciate over the years: "Don't Feed the Troll." You see, a Troll, per the Urban Dictionary, is "[o]ne who posts a deliberately provocative message to a newsgroup or message board with the intention of causing maximum disruption and argument." The rule is, when you spot a Troll on your website, you do not, under any circunstances, dignify their comments with a response because, if you do, it will only "feed" their appetite for disruption. A Troll is not in it for dialogue; they're only in it for aggravation. Namely yours. 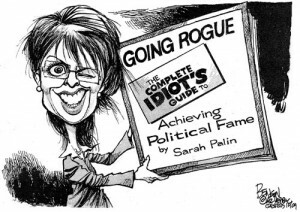 Despite the media's recalcitrant insistence on reserving a seat for the former half-term governor (hereinafter "FHTG") at the table of our national political discourse, Sarah Palin is a Troll. As such, I try not to dignify anything she says or does. Ever. (that would be "feeding" the Troll) However, in light of the fact that Hell hath frozen over (see Republican Joe Scarborough PWN!!! Palin in his latest Poltico article) I'll make an exception just this once and then I will likely never do a post about FHTG Palin ever again unless she actually runs for President in 2012. So listen up 'cause I'm only gonna say this once. Everybody knows that Palin is a busy woman. The former half-term governor of Alaska stays so busy these days that one wonders how this mother of five manages to juggle her new reality show, follow her eldest daughter’s dancing career and launch her latest frenetic book tour while still finding the time to insult a slew of revered presidents and first ladies. You’ve got to admit hers is a breathtaking high-wire act. FHTG Sarah Palin is NOT Qualified to be President of the United States. Period. Point blank. End of Discussion. How do we know this? Because over the past 2 years FHTG Palin has demonstrated in unequivocal terms that she lacks the intellectual fortitude to take a seat at the adult table and talk politics on a world scale. Her criticisms of the President and the First Lady are merely knee-jerk talking points, the likes of which reveal FHTG Palin's misunderstanding of the actual role (not to mention history) of the Presidency in this country. Likewise, her commentary regarding the Constitution also displays a fundamental lack of understanding that should be a given for any candidate seeking the highest Constitutional office in the land (Dr. Laura can get her First Amendment rights back by quitting a PRIVATELY OWNED radio show? Really?). Even the manner in which she speaks - word choice, vocabulary (or lack thereof), soliloquies, metaphors, etc. - all display a pattern of lazy thinking comensurate with somebody who supports (and personifies) anti-intellecutalism. To put it bluntly, she's an idiot. Nearly every Republican I know openly admits that, at the very least, she's not exactly somebody who would know how to speak with world leaders who are, for the most part, highly educated people. But perhaps what is most telling about FHTG Palin is what goes unsaid - as in real solutions to the problems facing America. FHTG Palin is great at taking shots at President Obama, but that's only because she has the luxury of not walking in his shoes or knowing what he knows. Unlike Obama, she doesn't have to go to town hall meetings full of hurting Americans or angry House Republicans and spout foreign policy, domestic policy, Constitutional amendments and federal regulations off the top of her dome without teleprompters - nor does she have the intellectual capacity to do so (the palm of one's hand can only hold so many notes, you know). I bring up all of this to say that WE the People should have noticed this a long time ago and, accordingly, we should have taken an affirmative stand to stop feeding the Troll. And while we were at it, we should have also reminded our cousins, sisters, brothers, neighbors and friends to stop doing the same. There is absolutely NO reason, whatsoever, why a politician who quit her job in politics over a year ago should still have a voice in our national political debate. Her opinion doesn't count anymore. And do you know why her opinion doesn't count anymore? Because when given the chance to maintain her relevance as a political leader, FHTG Sarah Palin made a clear choice between politics (aka: helping the people) and money (aka: helping herself), and she chose money. Any questions about whether she still has any relevance in our national political debate should have been resolved in the negative at that precise moment when she made it crystal clear that she's not here to be taken seriously, folks - she's just here to get paid. Domestic Monitoring: The Beginning of the End? The Collapse of a Nation? So That's How It's Gonna Be, Tim Scott?